Speaker: Chai Ling, leader of Chinese student movement. Graduates: 369 undergraduate students, 34 graduate students. Degrees: bachelor of arts, bachelor of science, master of arts, master of education. Harold F. Johnson Library Lawn. Speaker: Winona LaDuke, environmental activist. Speaker: Baroness Susan Catherine Campbell, British government sports administrator. Graduates: 452 undergraduate students, 295 graduate students. Degrees: master of arts, master of education, master of science, master of business administration degrees, bachelor of science, bachelor of arts, bachelor of fine arts degrees, associate in arts, associate in science. Honorary degrees: Baroness Susan Catherine Campbell and Virginia M. Judge, Endicott trustee and alumna, president and chief executive of Honeycomb Company of America. Speakers: David Gergen, CNN senior political analyst and presidential adviser; Christopher Lynch, MBA ’91, vice president and general manager of Vertica Systems. 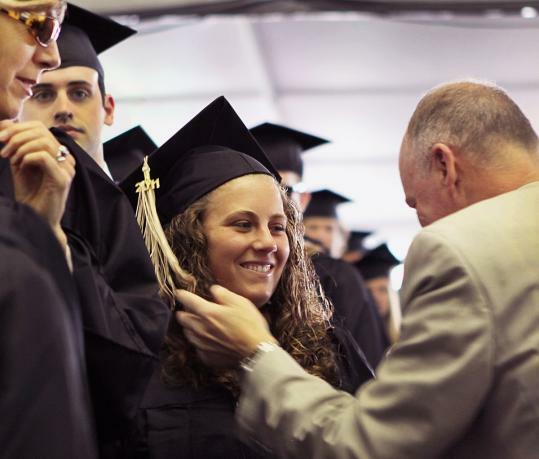 Graduates: 1,005 undergraduate students, 718 graduate students, two doctoral students. Degrees: bachelor of science, bachelor of arts, master of business administration, master of science, doctor of accountancy, doctor of business. Honorary Degrees: David Gergen, doctor of laws; Christopher Lynch, doctor of commercial science. On the Dimple (campus green). Speaker: Richard Stengel, managing editor of Time magazine. Honorary degrees: Richard Stengel; Wheaton alumnae Wyneva Johnson, class of 1971, an assistant US attorney; Susan J. Stampler Paresky, class of 1968, senior vice president for development at the Dana-Farber Cancer Institute in Boston; and Hope Hamilton Pettegrew, class of 1961, cofounder of Cobblestone, a history magazine for children, and a former Wheaton trustee. Speaker: Hubie Jones, former Boston University dean, founder of the Boston Children’s Chorus, and a founding board member of City Year. Graduates: 373 undergraduate students, 37 graduate students. Degrees: bachelor of arts, bachelor of science, master of education. Honorary degrees: John DeRosa, doctor of laws; Mayor James Ruberto, doctor of public service; Sister Eunice Tassone, doctor of humanities. Degrees: associate of arts, associate of science, certificates. College Green on Western Avenue. Degrees: Bachelor of arts, bachelor of science, bachelor of science in education, bachelor of social work. Honorary degrees: Tuohy; David Carter, chancellor emeritus of Connecticut State University System; John A. DiBiaggio, former president of University of Connecticut and president emeritus of Tufts University; Marilynn Monahan, executive director of Reading Assist Institute and former secretary treasurer of the National Education Association; Laura Dubester, pioneer of Green movement and codirector of Center for Ecological Technology; Alan Silverstein, pioneer of Green movement and codirector of Center for Ecological Technology; James Mullen Jr., president of Allegheny College.